Ara�jo, G. H., Gorlach-Lira, K., Medeiros, D. S. & Sassi, C. F. C. Physicochemical and bacteriological seawater quality and sustainability of Cabo Branco (Brazil) coral reef. Pan-American Journal of Aquatic Sciences, 10(2): 94-104. Download PDF file (341 Kb). Rezende, G. A., Neunfeld, A. L., Estima, S. C. & Dumont, L. F. C. Size structure of the pink shrimp, Farfantepenaeus paulensis (P�rez-Farfante, 1967) (Decapoda: Penaeoidea), in a subtropical estuary: an assessment motivated by demand from fishermen. 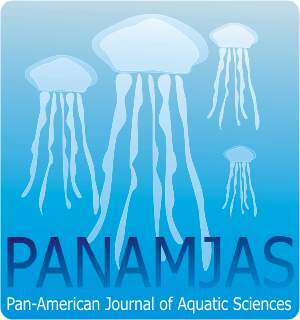 Pan-American Journal of Aquatic Sciences, 10(2): 105-115. Download PDF file (432 Kb). Tancredo, K. R., Marchiori, N. C., Roumbedakis, K., Cerqueira, V. R., Tavares-Dias, M. & Martins, M. L. Observations on parasite fauna of Centropomus undecimalis and C. parallelus (Perciformes) bred in southern Brazil, and its possible influence on the welfare of fishes. Pan-American Journal of Aquatic Sciences, 10(2): 116-121. Download PDF file (181 Kb). D�az, O. F. D., Bone, D. & L�pez-Ordaz, A. Polychaetes associated to calcareous sediments, Venezuela: Phyllodocida. Pan-American Journal of Aquatic Sciences, 10(2): 122-133. Download PDF file (292 Kb). Ivanoff, R. & Vooren, C. M. On growth and development of monozygotic twin embryos of the Shortnose spurdog Squalus megalops (Macleay, 1881) (Elasmobranchii: Squalidae). Pan-American Journal of Aquatic Sciences, 10(2): 134-140. Download PDF file (947 Kb). Favero, J. M. & Diaz, J. F. Daily and seasonal fluctuations of the fish community in the surf zone of an estuarine-coastal area of Southeast Brazil. Pan-American Journal of Aquatic Sciences, 10(2): 141-154. Download PDF file (411 Kb). Mendon�a, D. S., Gomes, M. A. A., Vieira, L. C. G. & Angelini, R. Local spatial factors influences birds and fishes communities in the Cerrado biome. Pan-American Journal of Aquatic Sciences, 10(2): 155-167. Download PDF file (505 Kb). Mugnai, R., Sousa, F. N. F. & Lorenzo, T. Monitoring hyporheic habitats: techniques for unclogging minipiezometers. Pan-American Journal of Aquatic Sciences, 10(2): 168-171. Download PDF file (170 Kb). Primost, M. A., Giulianelli, S., Gil, M. N. & Bigatti, G. Acute toxicity in two edible marine gastropods with different sensitivity to Tributyltin. Pan-American Journal of Aquatic Sciences, 10(2): 172-178. Download PDF file (419 Kb). Souza, A. S., Soares, R. X., Amorim, K. D. J., Ribeiro, R. S., Molina, W. F. & Garc�a-Jr., J. First record of Diodon eydouxii Brisout de Barneville, 1846 (Osteichthyes: Diodontidae) in Saint Peter and Saint Paul Archipelago, Brazil. Pan-American Journal of Aquatic Sciences, 10(2): 179-181. Download PDF file (346 Kb).